There are plenty of murloc cards whose name is a pun with the word "fin". Yet, they lost the opportunity make the only one of those puns which made actual sense, calling this guy "Silver Fin Recruit". Y'know, because fin is the murloc equivalent to hand. It also would've made more sense lore-wise. 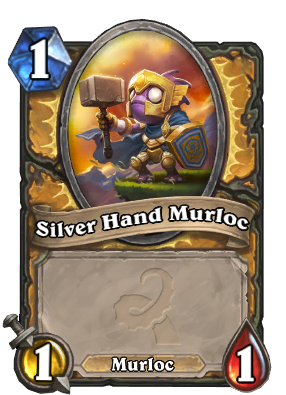 I see it easier for murlocs to have a Silver Hand Order rip-off than Silver Hand Order actually accepting murlocs as members. I assume since they're Silver Hand Murlocs they can't get buffed by Quartermaster and Warhorse Trainer? I tried it when I opened up a Warhorse Trainer; unfortunately, they don't receive the buff. I now have a reason to play Paladin for once in my life. If they be worthy, they shall possess the power of the Charged Hammer! 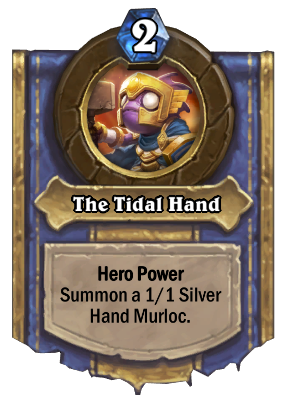 The hero power made me think it was gonna be a boring Murloc token, but this is damn adorable!